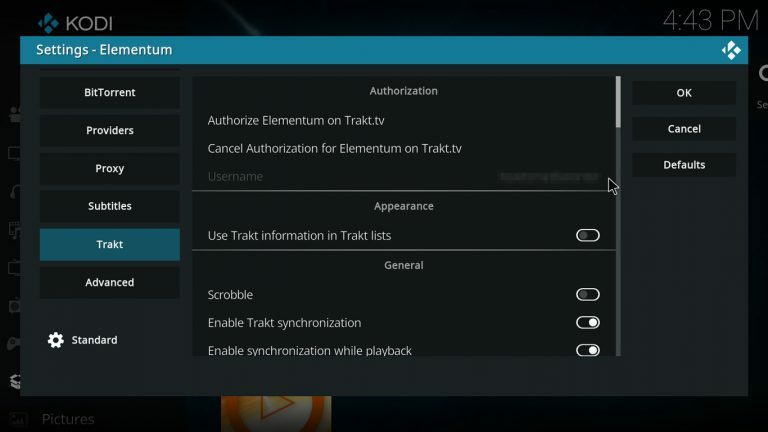 Elementum is able to use your Trakt.tv account to manage your Collection, Watchlist and other lists directly on Kodi, this is specially helpful if you want to keep your all your favorite shows and movies synchronized across all your devices. 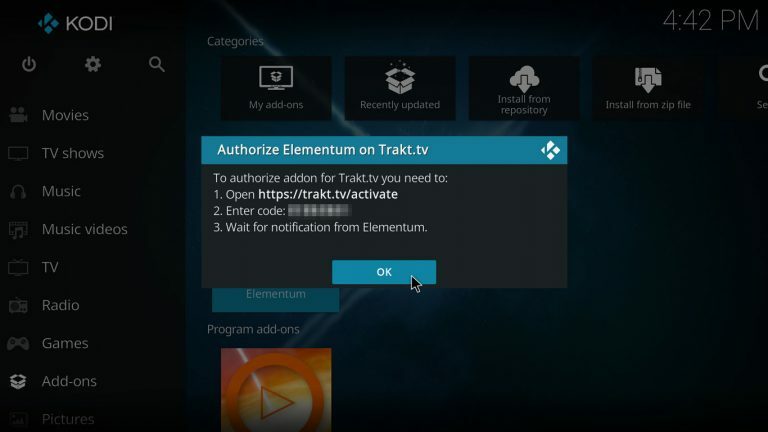 In this tutorial we’ll take a look at Trakt.tv and how to use it with Elementum. 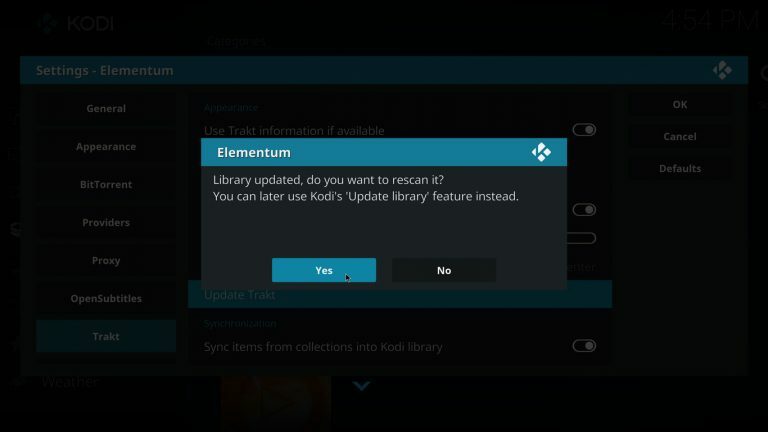 If you need help installing Elementum please read How to install Elementum on Kodi. 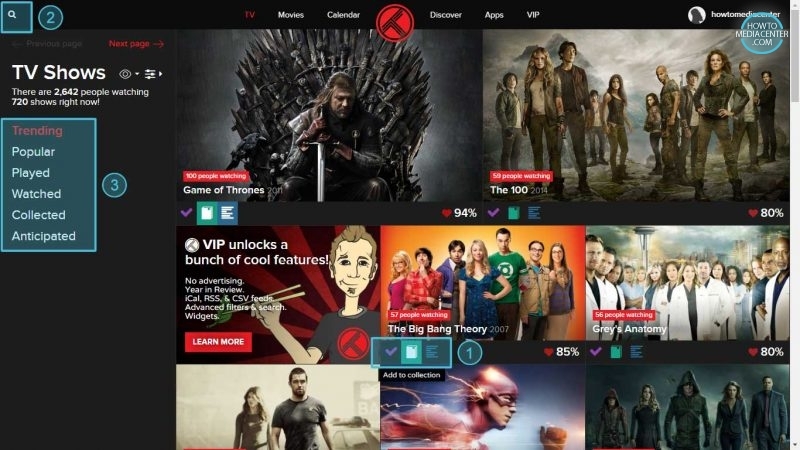 Trakt.tv is a free service that lets you organize your favorite TV shows and movies, it helps you to keep track of the things you’re watching on TV. 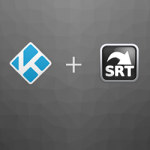 Trakt integrates with a lot of popular media center software and you can use it from a browser or smart phone app. We are going to focus on two specific Trakt features: Collection and Lists. 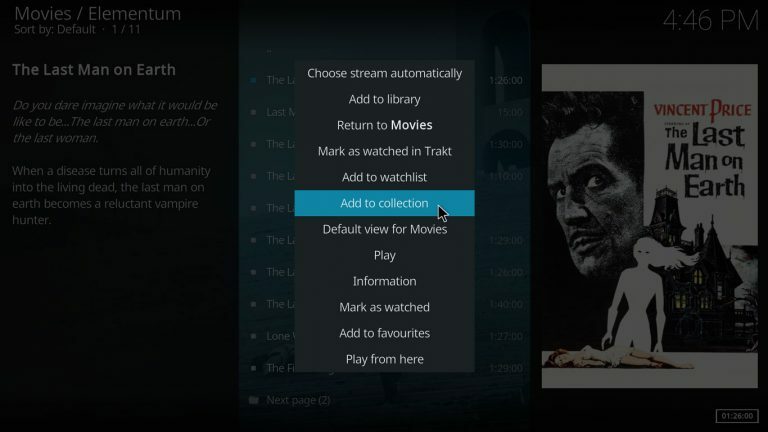 The Collection: it’s similar to the library on Kodi, here you’ll add your favorite shows and movies. To view your collection select Collection from the Profile Menu on the top-right corner. Use the Filter to select Shows or Movies. You can Sort the results by Title or Date. Lists: You can create your own custom lists here, Trakt comes with a default Watchlist you can use to add all the shows and movies you’d like to check out. To view your lists select Lists from the Profile Menu on the top-right corner. Add new lists using the Add Lists button. 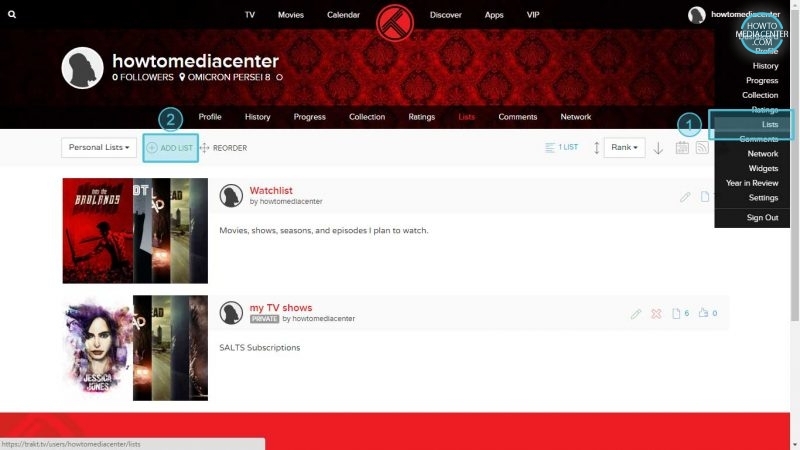 To add a show to your collection using Trakt.tv select “TV” from the Top Menu and click on the green book button located under the image of your preferred show. Use the buttons under each Show to Mark as watched, Add to Collection or Add to a List. You can search for specific shows or movies using the Search Box on the top-left corner. Click on Trending or Popular to explore new shows. Be aware that the Watchlist is a temporary list, this means that the movies and shows on this list will be automatically removed once they are marked as watched. On the other hand, the Collection and custom lists are persistent. 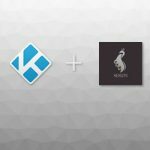 Try adding a couple of shows to your collection and check out the other features to familiarize yourself with Trakt, once you are ready switch back to Kodi. 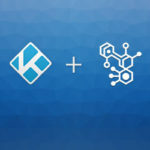 Elementum can get access to your Trakt Collection, Watchlist and custom lists, to do this you must authorize Elementum to use your Trakt account. 2. 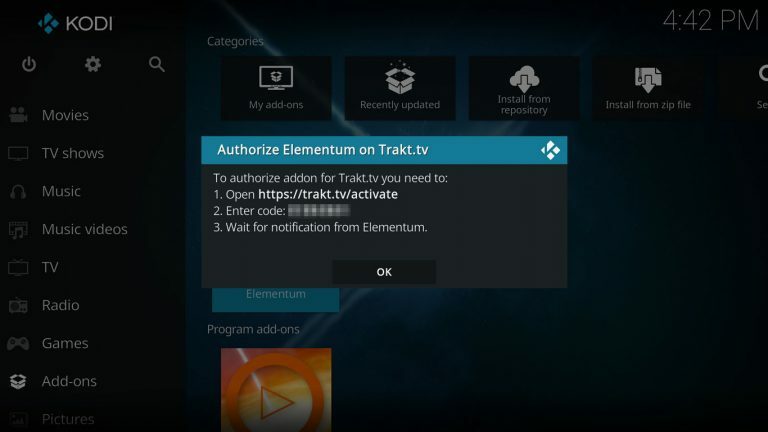 Select the Trakt tab and click on Authorize Elementum. 3. Elementum will generate an authorization code, write it down and don’t press the button yet. 5. 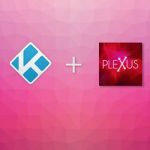 Press Yes to allow Elementum to use your Trakt account. 6. 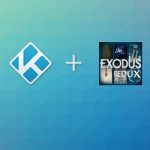 Go back to Kodi and press the OK button. 7. Wait a couple of seconds, you’ll see a notification and your Trakt user name should appear next to Username. Press OK to continue. 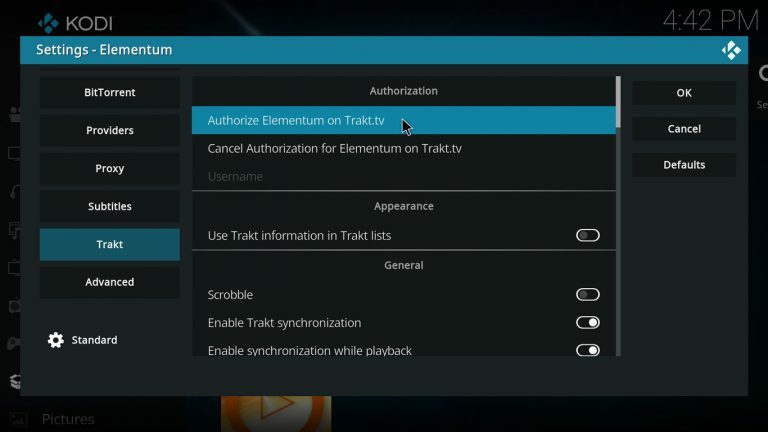 Authorizing Trakt will enabled new categories on Elementum’s TV Shows and Movies menu, use them to get access to your Collection, Watchlist and custom lists within Kodi. 8. 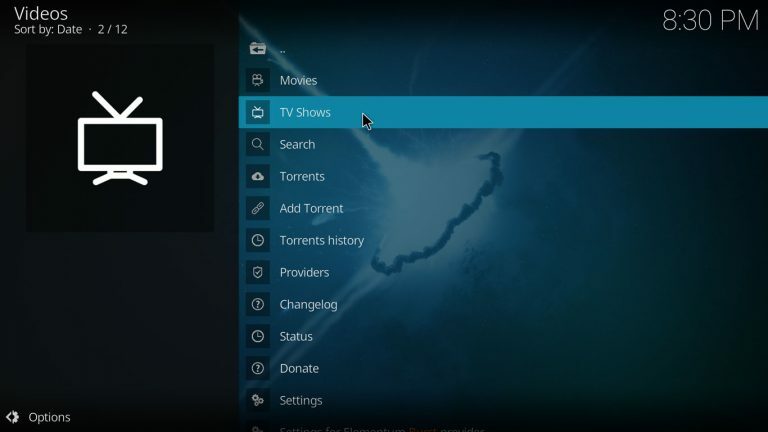 Open Elementum and select TV Shows. 9. 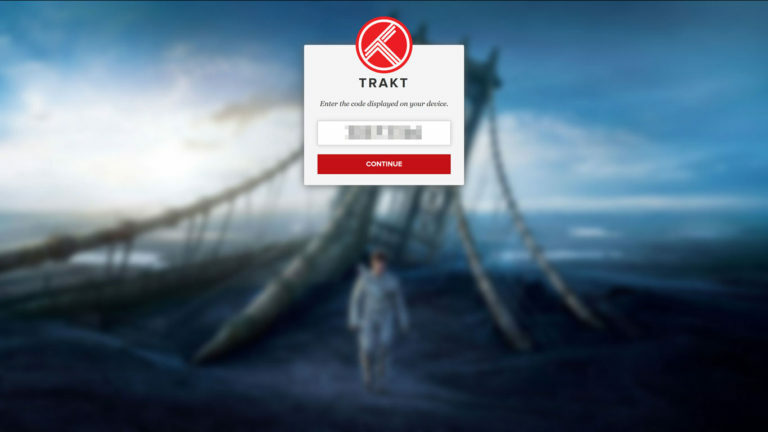 Use My Progress, My Lists, My Watchlist, My Collection and Calendars to get access to Trakt. Use the Calendars feature to view upcoming episodes of your shows. My Progress is like an automatic bookmarks list based on what you’ve watched. 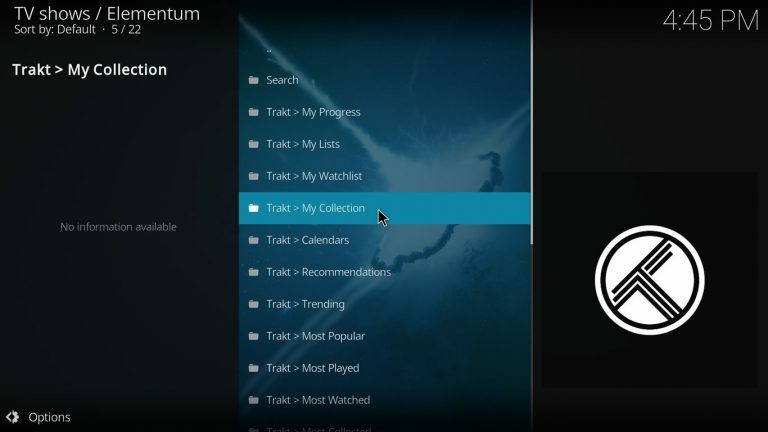 Elementum lets you manage items on your Trakt Collection and Watchlist. 10. Highlight a show or movie and open the Context Menu. Use Add to collection or Add to watchlist to add an item to Trakt. The Context Menu will show options to remove the item if it’s already on Trakt. Elementum can use your Trakt Collection, Watchlist and/or custom lists to populate the library. Items on your library will appear under the Movies and TV Shows tabs on the Home Screen. 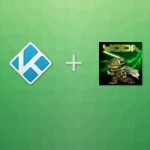 If you want Elementum to use the library please read Library Integration with Elementum Kodi addon. 11. 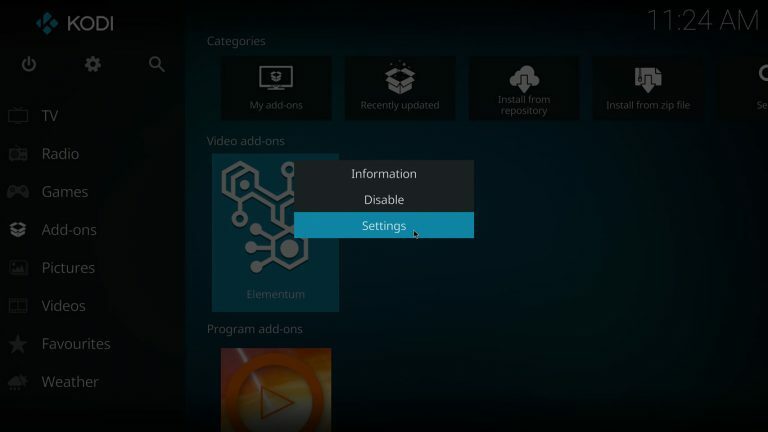 Use the Context Menu to open Elementum settings. 12. 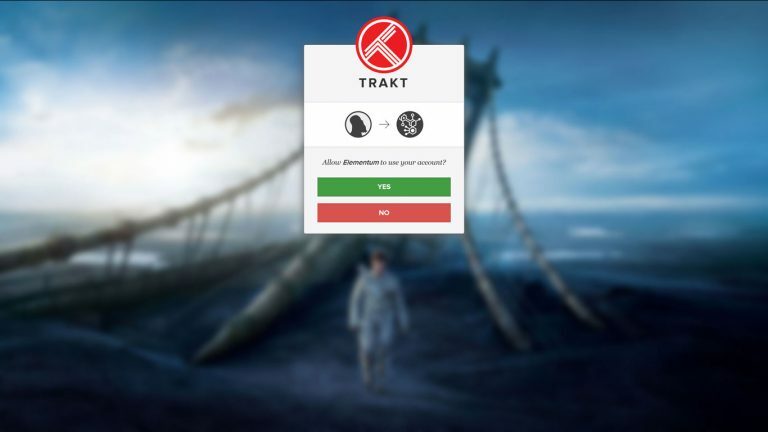 Select the Trakt tab, enable Use Trakt information if available and Scrobble. 13. 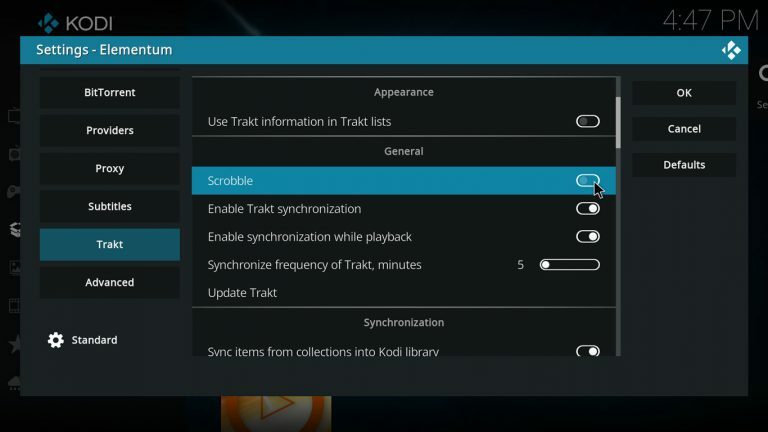 Scroll down to the Synchronization section and select which components of Trakt to sync with library. You can sync your library with the collection, watchlist and/or custom lists. 14. Press Update Trakt to import items from Trakt to the library. 15. Press Yes to refresh the library. 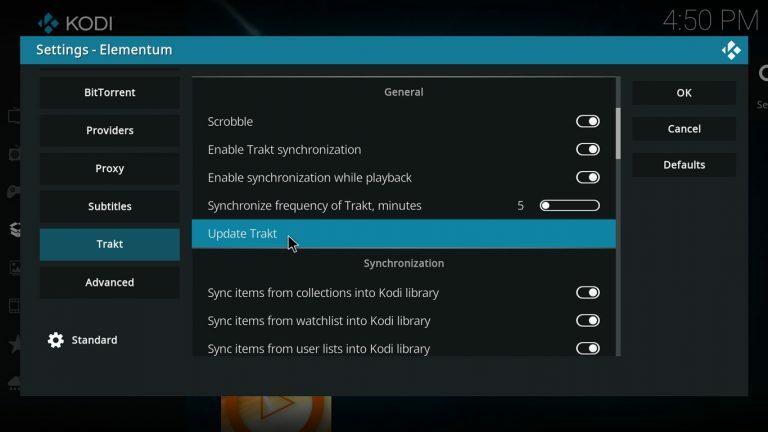 If your library doesn’t populate restart Kodi and try to Update Trakt again. Refreshing the library can take a couple of minutes depending on the amount of items on your library. Be aware that synchronizing items from user lists will sync all the items in all your custom lists, currently there’s no way to choose a specific list.